Great Air Ship at the Tercentenary, The, Burlington, Vt.
Black and white real photo postcard depicting a crowd surrounding a dirigible. 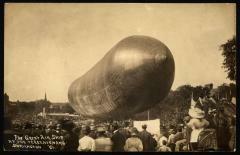 Captioned "The Great Air Ship / at the Tercentenary / Burlington, Vt." in lower left corner of front. Not labeled.